I can't believe I am quoting a Britney Spears song but the past couple of weeks have been quite the circus, as I went on my first-ever library interview and celebrated my birthday by trying a class in the flying trapeze. I had applied on the City of Santa Monica website back in September when I saw a listing for a PT Reference Librarian 1. It was perfect for me. Entry-level and part-time, which meant I was free the rest of the week to plan programs and performances for the library, write my book, and I would finally have health benefits for the first-time in seven years. I spent three hours meticulously reading over every single page of the application, making sure I had filled it out correctly with no errors. The only part that seemed confusing was that they wanted proof of my diploma, so since I couldn’t find a place to attach it online, I sent a separate email with a jpeg attached. Shortly after, I received the “we have received your application” confirmation email and breathed a sigh of relief. Now all I could do was wait and hope to get a call for an interview. Just one week later, the Mayor of Santa Monica, Bobby Shiver, comes into the restaurant where I work, and immediately thoughts of meeting him go through my head. I pray he gets seated in my section. He doesn’t. Still, not one to give up, I asked the server who was taking him if she needed helping serving the sake to his table. Any chance to have some kind of interaction with the man, who could perhaps have an influence on me getting an interview for the job at the library, was worth it. After all, it is a city job, so wouldn’t a reference from the mayor be a real bonus? After introducing myself as a librarian waiting tables to make ends meet, not to mention hitting on some important library issues that need addressing, he hands me his card and asks that I send my resume to him on Monday morning. He liked my energy and thought I would be a great addition to the library. All weekend I am flying high at the thought that this time things were falling into place for me. Per his instructions, I sent an email Sunday night attaching my resume, cover letter, completed application, and list of references. At 10:30am Monday morning, his office calls saying they received the email and have forwarded it along to the right people. Wow, a politician following through on a promise – a true miracle if I ever saw one. Sadly, not an hour later, I receive an email from the HR Dept saying “It has been determined that your application cannot be accepted because it is incomplete or missing required materials.” WHAT? I didn’t understand. Were they offended I got the Mayor involved? Did they not get my email with the diploma? And, how could they just dismiss my application without first trying to fix what was wrong? Ugghhhhh! So I reply to the email, leave a polite voicemail, and hope this is not it. I felt so powerless. Two minutes later, I get another email, this time from the City Manager saying he got an email from the Mayor and that I am doing the right thing in applying through Human Resources. After wishing me well, he gives me the name of the HR director should I have any further questions. Since I had not heard back from the HR Dept in regards to what was wrong with my application, I decide to call this new person and see if she can help me learn what the problem is with my application. Sure enough, they didn’t get the email. One minute I am a loser, the next, I am a winner – all because I decided to follow up with a phone call. A real lesson that if you want something, you go after it, no matter what. In preparation for my oral interview the following week, I read every paper I ever wrote in my Masters program, reviewed articles online, and spoke with numerous library friends about what to expect during the interview process. Never in my life have I studied so hard for a job interview. I also tried on numerous outfits, revamped my portfolio of work, and even double-checked this blog to make sure nothing was too offensive for the library board should they come across it. I felt I was ready. The morning of the interview, I walked into the library an hour early just to review sample questions and to make sure I was calm and presentable. I walked into the interview ready to blow them away with everything that made me the unique librarian I knew I was. No way would they not want to hire me – I wanted it too much. The two women who opened the doors to the conference room, instantly stretched out their hands in formality, before sitting down behind names which were displayed boldly on place cards with black Sharpie pen. I bit my tongue so I wouldn’t crack a joke. It was like that scene in “Back to School” where Rodney Dangerfield has to recite poetry in front of the entire teaching staff in order to graduate. Pressure was on. Immediately they explained that they would be asking me questions and taking notes on my answers. And that is exactly how it went for the next half-hour. Question. Answer. Notes. Question. Answer. Notes. At the end, I tried to show them some of my work displayed colorfully in my binder, but one somewhat laughed and said, “I wondered why you brought all of that,” and looked toward the door out of disinterest or anxiety at the thought of more interviews with idiots like me. I felt stupid and realized for the first time that perhaps my personality wasn’t going to be the selling point in this line of work. If they were going to follow protocol and policy, there probably wasn’t much room for creative innovators like me, who not only thought out of the box, we stood on it with fabulous shoes. For once, I was told not to ask questions about the job, but instead, told to deal directly with the HR department, of which later, they didn’t have much to say either. One week later, and I was in Las Vegas celebrating my birthday by going to see the Cirque Du Soliel show O at the Belliagio. I had wanted to see the show for years because of all of the synchronized swimming, which I loved doing as a child. While watching the performers on the trapeze swing freely in the air, before jumping off into the water, I felt a smile come to my face. Things were working out. My hard work was paying off. Life was going to start making sense again. The next morning, I checked my email and there it was again “Congratulations! You successfully passed the oral interview for the position of Librarian I (Reference). Your final score is 87.0. You have been placed in band 3.” To which I screamed excitedly, until I realized I had no idea what any of that meant. Band 3? I wasn’t a musician, I was a librarian, but I was no dummy, being 3rd didn’t sound good at all. After another email to HR, I realized that I had no reason to celebrate. I wasn’t being called in for an interview until the candidates in Bands 1 and 2 were exhausted and that wasn’t going to happen when so many experienced, out-of-work librarians were probably in Band 1 and 2 because they have been librarians for 10+ years and like robots, knew how to answer questions about what to tell a patron when the library no longer carried their favorite magazine. The real question was what to tell a hopeful, ambitious, and creative wannabe librarian, working as a server for the fifteen time, that with four years of stellar grades in a Masters degree, a year of working for free as an intern and volunteer, and even an endorsement from the frickin’ Mayor, that her dream of becoming a librarian was once again smashed to bits for some reason or another. I don’t have an answer for that one either. While I was down about not getting the library job, I still had my birthday to celebrate, so I decided to go down to the Santa Monica Pier to take a trapeze class with TSNY Los Angeles, an idea I had come up with when I found a coupon in the reference section at the library during one of my study sessions. None of my friends had wanted to do it, so like most things in my life, I once again did it alone. For some reason, I was sad this time. Maybe it was not getting the library job, or not celebrating with my ex like I had the last three years, or maybe it was because I felt helpless and confused at what my life had become. When I was high above Santa Monica with that trapeze bar in my hand, I thought about the journey it took to get me there. I thought of all of my failures, my successes, my dreams, the love I felt for people that didn’t love me back. I thought of having 92 jobs and wondering how that came to be – was it me settling for things, or me failing and being too afraid of the things I really wanted. I thought of the person I was, the person I wanted to be, the person everyone thought I should be. Nah, I didn’t think of any of that. My only thought was just how awesome it was way up there, and how glad I was that I didn’t let anybody else’s BS prevent me from doing it, including my own. Nothing mattered but the wind on my face, the chill in the air, and my instructor’s voice telling me what to do. By following her directions and trusting the wire hooked tightly to my waist, I felt free for the first time in years. Unlike life, there was a massive net beneath me should I fall, not to mention a good looking guy ready to catch me when I finally let go of that bar. It took strength to orchestrate some of the moves, but it mostly took concentration and faith. On landing, I squealed in delight like a girl of thirteen, not thirty-six. It was a moment of pure joy. I had forgotten what life was like before the whole world got involved and made it complicated. Before I made myself the ringleader in my own personal circus, inviting all of you in to watch the show that is my life. Yet here I am, doing it again. I might not be the one who always gets the job, but I just might be the one to show you what is possible if you aren’t afraid to put yourself out there and jump. While attending the American Library Association's National Conference in Washington DC this summer, I jumped at the chance to speak with comedy legend Paula Poundstone about her love of libraries. 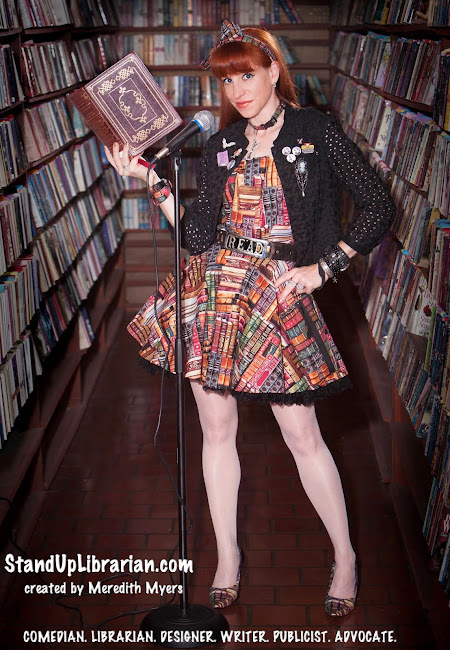 As this blog was created in order to combine my two loves - comedy and librarianship - she turned out to be the perfect subject for my first-ever celebrity interview to be featured on this blog. Paula is not only a great advocate for the library field, she is still one of the best stand-up comics of all time, which is obvious as she delivers some hilarious library material of her own. Enjoy!